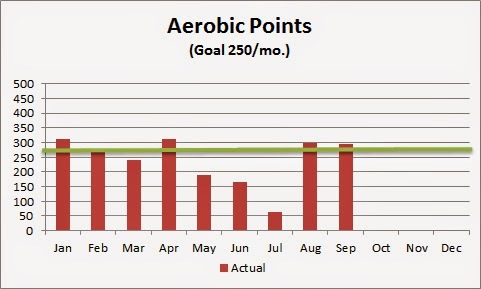 Another month has dashed by, and it is time to fess-up to how I did with my twin goals of exercise and weight. Good news all around. 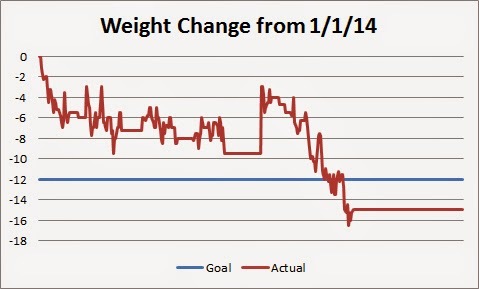 I met my exercise goal for the month and reduced my weight below the 12-pound weight loss goal for the year. The key for the last quarter of the year is to maintain exercising and keep off the lost weight through the end of the year. Overall on exercising, I now have had more months of success than failure and have the opportunity to end on a solid note. Keeping weight off after losing it has been a continual problem for me. On average I've gained three pounds in the last three months of the year. If I were to do that this year, I would still technically meet my original goal, but it would not feel like a success. Therefore, I'm mentally resetting that goals so success means that I continue to maintain the current 15-pound weight loss. Check back in a month and we'll see how I've done.